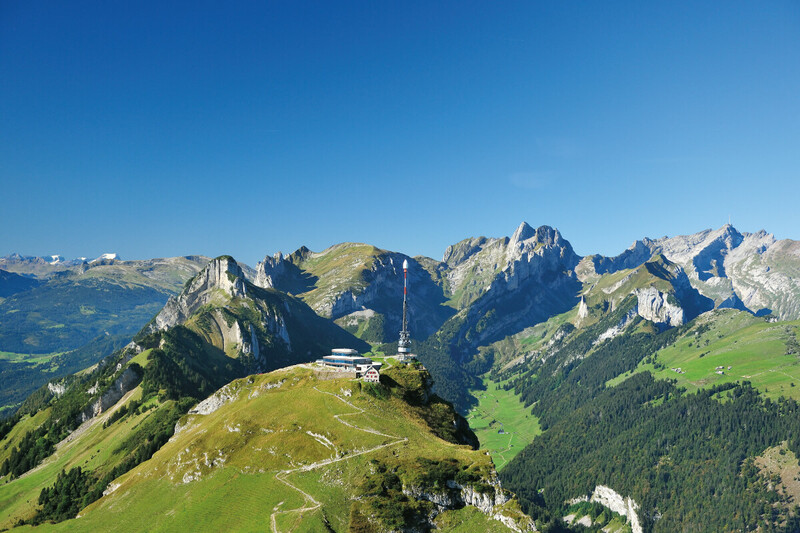 How to best explore the Appenzell Alps? Start from Hoher Kasten, the Top of Appenzell! The hamlet of Brülisau is also the gateway to Hoher Kasten. 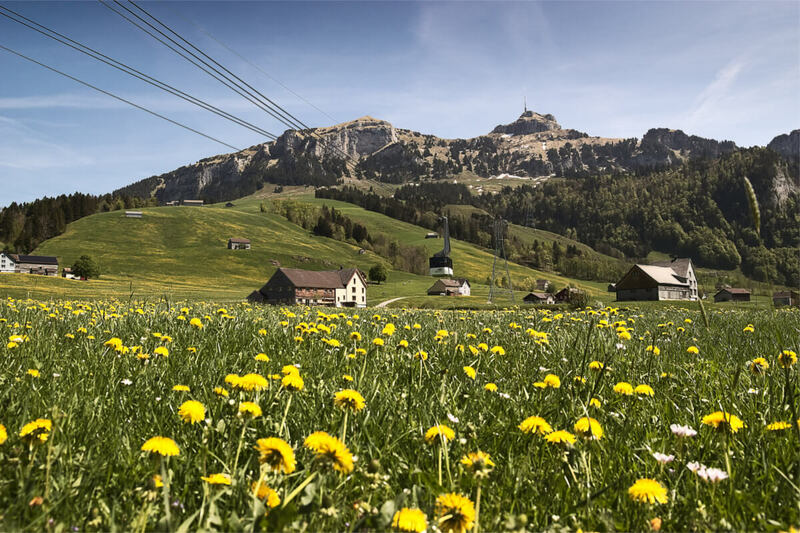 Surrounded by green meadows and dotted with idyllic farmhouses, you will find the cable car departure. In no less than eight minutes, you will be lifted off the valley floor onto the summit of Hoher Kasten. The cable car ride to the top is an experience in its own right as you will be able to enjoy spectacular views shortly after departure. 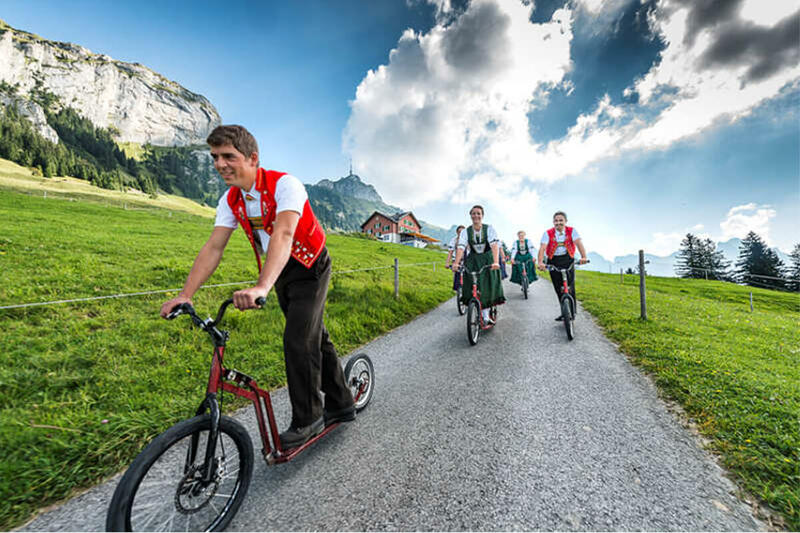 Pay attention to the friendly cabin attendants who will greet you in the special Appenzell dialect. How charming, and how Swiss! Good to know: children up to 15 years travel free of charge on the Hoher Kasten cable car. So, why not make this an excursion for your entire family? Or why not show off the beauty of Switzerland to your friends with kids who are visiting from abroad? Located in the heart of Europe, the Hoher Kasten peak offers experiences for everyone. The only revolving restaurant near and far is located smack on top of Hoher Kasten at 1794 meters above sea. The restaurant revolves around its own axis within an hour, allowing for unobstructed panoramic views. Whether you are deciding to have lunch at the restaurant or simply a cup of coffee, try to spend some time inside the restaurant to feel the rotating effect! Needless to say, local Appenzell delicacies, friendly hosts and just all-around a great atmosphere complete this experience. It is worth checking the event calendar as there are a variety of authentic events taking place on Hoher Kasten. Try their lavish brunch or the so-called Vesperplättli, a traditional afternoon snack of Appenzell specialties. And each month, there is a full-moon dinner in the revolving restaurant, including a four-course meal and traditional Appenzell music performances. For these special events and those beautiful sunset views, the cable car will kindly extend its opening hours. With five viewing platforms and lined with benches, the aptly named Europe circular trail invites to linger and marvel. There are free-of-charge telescopes to take a close-up look at all those peaks that can be seen from the Hoher Kasten. Along this summit trail, a unique alpine garden features up to 300 alpine plants for you to see. Access to the alpine garden is free of charge, and rare plants are even labelled. The Hoher Kasten alpine garden association breeds seeds with care, resettling endangered alpine plants. Every spring when the snow has melted, the plants awake from their hibernation. Trust me when I say that it is amazing to watch this spectacle of blooming flowers! The Hoher Kasten is the perfect starting point for a variety of hikes across the entire Alpstein region - for all levels. From families with children to experienced hikers – there is a suitable hike for everyone. One of the most popular walks is the Geological Trail, which leads from the Hoher Kasten via Staubern and Saxerlücke to Bollenwees. It takes around four to five hours. 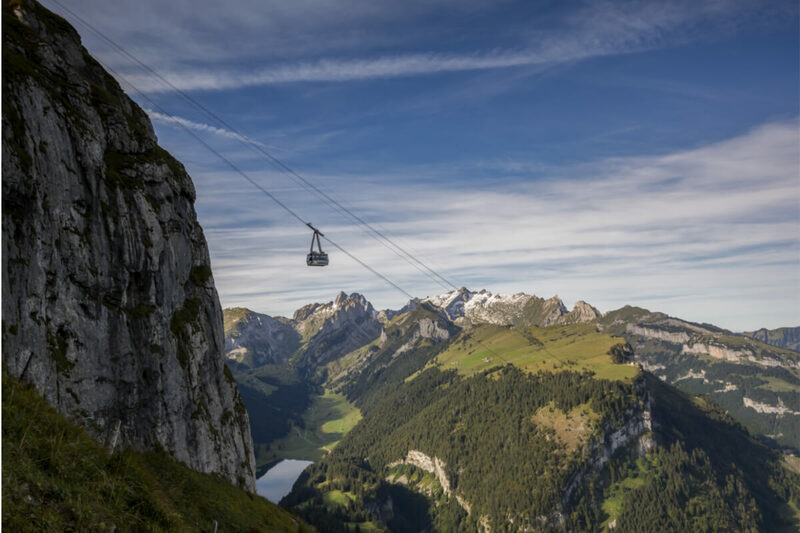 With panoramic views over the Rhine Valley and the rolling Appenzell hills, as well as over the surrounding mountains, this trail is a must for everyone who likes a bit of a challenge. This first geological hiking trail in Switzerland makes its way from the Hoher Kasten along the southern chain of the Alpstein. It opens up a fascinating array of geological layers from past millennia - no special skills needed to enjoy this geological wonder. After a well-deserved break at the Bollenwees, the trail continues to yet another lake: Sämtisersee. In case you need another break or a refreshing Flouder soda, there is a mountain inn just a few minutes' walk from the lake. Essentially, there are so many idyllic mountain inns that you will never need to walk for more than an hour. Many offer overnight accommodations, too. Are you still with me? After another breathtaking stop, you will be hiking about 50 minutes to the Ruhesitz Mountain Inn. There, you have two options: either you can hike another 45 minutes down, or you hire a scooter and race down the street to Brülisau! Either way, you will have reached your final destination. I always recommend a visit to Appenzell, the small capital with its historic center. In fact, there are many things to see and do, such as window shopping among the specialty shops with local handcrafts. Another favorite of mine is taking photographs along Hauptgasse, the town's main street. Lined up along the alleys are colorful houses that have been skillfully adorned in traditional fashion. Those with sore legs from hiking in the Alpstein will find plenty of food choices, too. I recommend stopping by a pastry shop of bakery to find the traditional Bärli Biber, among other delicacies. If you want to experience the ultimate Alpstein adventure, look into the so-called Rondom zfrede package, an all-inclusive offer which promises to leave you "utterly satisfied." The package includes a cable car ride to Hoher Kasten, followed by a hike to the Plattenbödeli or Ruhesitz mountain inns. There, you will be spending the night in one of various room classes - delicious breakfast included. The next day, you may return to the bottom or extend your hiking adventure along the geological trail.